Do you realise what you’re saying? Why, you’re telling me that I’m dead. (SPOILERS) D.O.A. has a fantastic premise, albeit an extremely contrived one. You can imagine the pitch; “A man walks into a police station to report a murder; his own!” The studio executives roundly applaud. This sort of gimmicky scenario can only be sustained by movie logic, and Rudolph Maté’s flashback narrative follows suit. 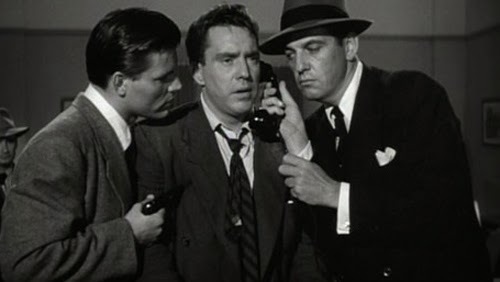 The result is a rickety film noir, lacking the polish of the greats. But how many movies give you a hard rolling lead protagonist who also happens to be an accountant? I first saw D.O.A. as part of the second season of BBC2’s Moviedrome. I’m unsure if this was before or after I caught the Dennis Quaid/Meg Ryan remake. In his introduction presenter Alex Cox memorably complained about the bizarre use of a Clangers whistle, which pipes up on the soundtrack every time Edmund O’Brien’s Frank Bigelow sees an attractive woman. It seems to have strayed in from an entirely different movie, the kind of thing you’d expect to accompany Harpo Marx. 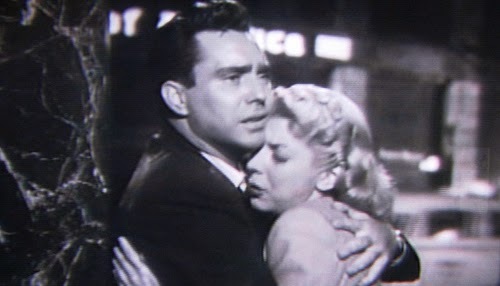 Perhaps Maté and screenwriting partners Russell Rouse and Clarence Greene intended to contrast O’Brien’s holiday jolly with the ensuing sobering realisation that he has been poisoned. If so, they don’t succeed; the (overlong) introductory passage is hard work. Frank may be a louse for leaving secretary/girlfriend Paula (Pamela Britton) hanging while he goes on totty-hunting jaunt in San Francisco, but Paula is hugely annoying. So much so that his dive into debauchery seems like the only sane course of action open to him. As part of Frank’s walk on the wild side there’s an amusingly over-amped depiction of a jive bar, filled with crazed hepcats. Frank Bigelow: Do you realise what you’re saying? Why, you’re telling me that I’m dead. Bigelow awakes from a night of carousing feeling particularly the worse for wear, so rather sensibly goes straight to the nearest doctor. The writers, never ones to repeatedly look a gift gag in the mouth, have a doctor instruct Frank “I don’t think you understand, Bigelow. You’ve been murdered!” To be honest, I probably wouldn’t be able to resist either. Even Frank is at it later. Encountering a moll, he opines, “Sure, I can stand here and talk to you. I can breath and I can move. But I’m not alive”. Even when they’ve milked that one to death there’s time for another final grim chuckle, this time involving the film’s title. 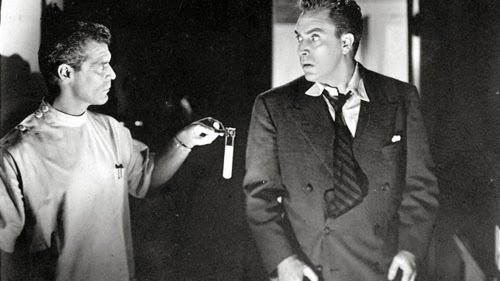 The end credits appear to verify the existence of the substance used to kill Frank (“Luminous toxin is a descriptive term for an actual poison”), just in case you thought the scene where Frank gets a second opinion and the consulting doctor comes in with a glowing test tube, which he proceeds to wave about in the dark, was over-the-top. It’s radioactive you see, and “one of the few poisons of its type for which there is no antidote”. This doesn’t sound like a fun way to go, as it attacks the internal organs and kills in the space of a week. At least the effects appear rather less extreme than those of the polonium used to poison Alexander Litvinenko back in 2006. Indeed, when Frank succumbs it ranks up there amongst the most sudden and inept movie deaths. O’Brien strikes out unconvincingly and collapses behind a desk. O’Brien essays the transition from skirt-chasing cheese hound to desperate bruiser quite agreeably. 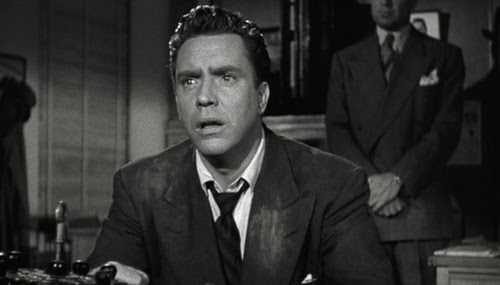 He has that disenchanted drollery thing going for him, the sort of act you expect from Bogart. And his encounters (barring an interminable scene where Pamela comes to visit) are generally lively. Frank’s realisation of the important things, just as he is poised to meet his maker, is suitably cynical (come on, we’re not buying that he actually loves Paula; he’s just scared of dying), and the ladies he encounters move accordingly from being positioned as lust objects to obstacles in his path. 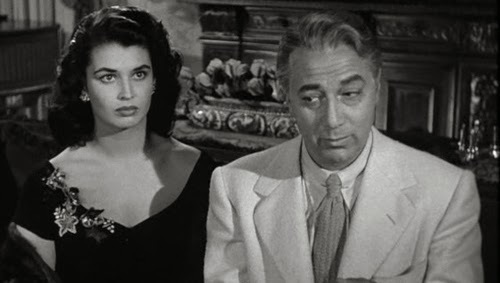 Particularly amusing is Laurette Luez as a dusky femme fatale, informing Frank “If you were a man, I’d punch your dirty face in”. The best of his opponents is crazy grinning bug-eyed loon Chester (Neville Brand), henchman and nephew of Majak (Luther Adler). Chester is an unbridled cartoon sadist, referring to himself in the third person and fantasising over the most painful method of terminating Frank (“I think I’ll give it to you in the belly”). When Majak refers to him as “an unfortunate boy”, he’s couching the understatement. 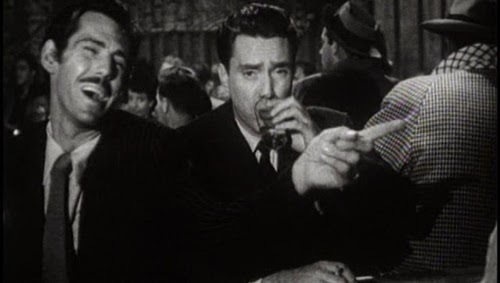 Chester’s final scene, in which he embarks on a shooting spree in a pharmacy, rather wonderfully has him lamped by an old geezer with a bottle. Maté, a former cinematographer, gives the location work a certain amount of zip, but the interiors tend towards the stagey and unimaginative (an exception is the opening sequence). The main problems come from the script, however. If the irony of Frank’s fate is rather forced (“All I did was notarise a bill of sale”) the trail to the perpetrators lacks flair; the mastermind behind it all is fairly obvious, and the plotting required to reach the reveal manages to be both repetitive and convoluted. 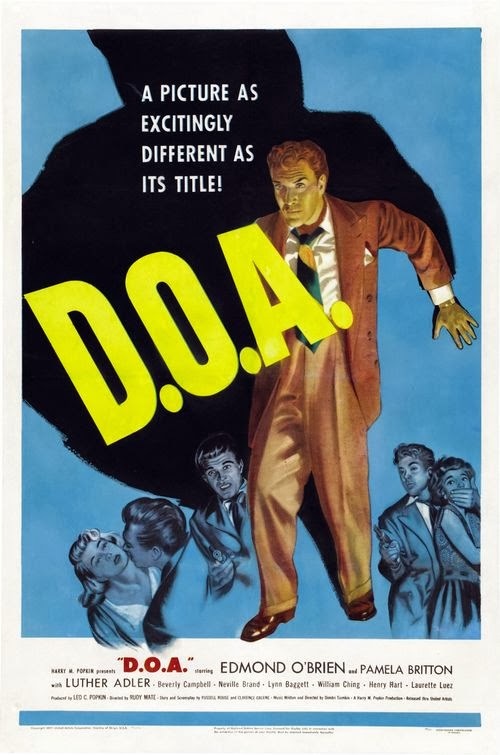 Still, this is solid B-movie hokum and the irresistible premise brings with it a fair amount of goodwill.